Evaluate the ability of k-means initializations strategies to make the algorithm convergence robust as measured by the relative standard deviation of the inertia of the clustering (i.e. the sum of squared distances to the nearest cluster center). 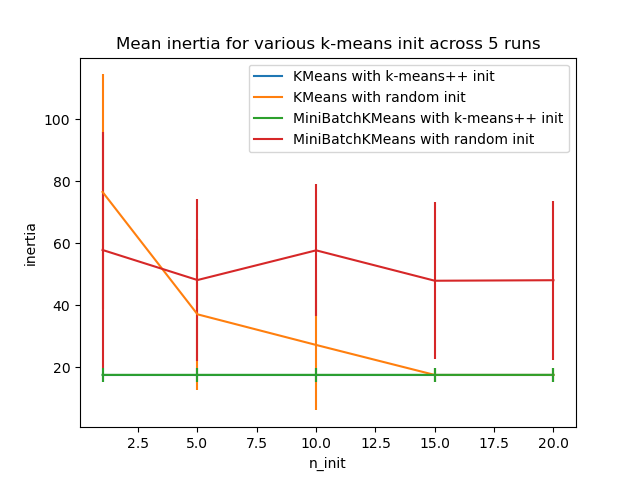 The first plot shows the best inertia reached for each combination of the model (KMeans or MiniBatchKMeans) and the init method (init="random" or init="kmeans++") for increasing values of the n_init parameter that controls the number of initializations. The second plot demonstrate one single run of the MiniBatchKMeans estimator using a init="random" and n_init=1. This run leads to a bad convergence (local optimum) with estimated centers stuck between ground truth clusters. The dataset used for evaluation is a 2D grid of isotropic Gaussian clusters widely spaced. 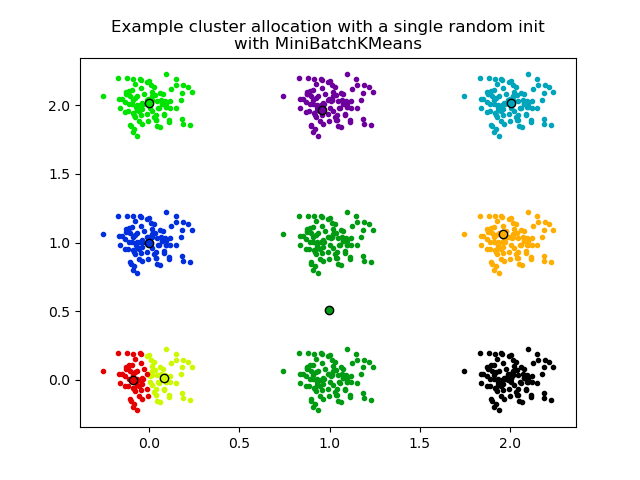 plt.title("Example cluster allocation with a single random init\n"